This year the Office of Student Leadership and Activities has launched a new successful program called the Senior Service Day series. This series targets senior students and gives them the opportunity to participate in various service projects throughout the academic year. First-years, sophomores, and juniors are also encouraged to sign-up should there be any available spots not filled by seniors. Our first project was on September 17th when we volunteered with the Nassau Chapter of Habitat for Humanity. Fifteen students volunteered to help build a home for a local Mineola family who has devoted their lives to taking care of individuals who are mentally challenged. The home was still in the beginning stages and all day we helped build the outside wood frame of the home. It was a lot of hard work, but at the end of the day there is no denying that volunteering with Habitat for Humanity is a rewarding experience for everyone. 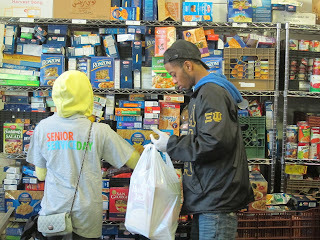 Our second service project for the Senior Service Day series was just this past Friday, on November 18th. In the Thanksgiving spirit, twenty students volunteered to go to The Interfaith Nutrition Network (INN) to help cook and serve the guests of this local soup kitchen. Students also helped to sort both clothing and food donations. The INN has been an important community partner of Hofstra's since it first opened its doors almost thirty years ago. Hofstra students volunteer with The INN on a regular basis and we were glad we could make The INN a part of our Senior Service Day series. Seniors who are looking to get involved in this series, please keep an eye out for even more service projects in the spring semester!